We are very excited to present Kendrick Smith for this months Local Monthly Saxophonist Showcase, on Saturday, July 15 from 2pm-4pm. 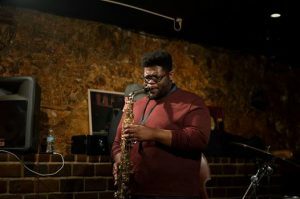 Kendrick has been on the rise here in St. Louis for several years now, and is definitely one of our favorite local Alto players. He is also one the only guys we know of who is playing a straight alto full time. Saxophonist Kendrick Smith was born in East St. Louis, where he attended East St louis Senior High School. While attending high school he began studying with Renown Saxophonist Hamiet Bluiett, who played with Charles Mingus as well as being a founding member of the World Saxophone Quartet. After high school he received a scholarship to attended SIUE where he studied with Jason Swagler. Since college he has continued to play in the St. Louis area playing with his own band as well as playing in other bands around town. His accolades include playing Baritone Sax for Grammy Award winning singer Dennis Edwards and the Temptations, World renown poet Ntozake Shange, opening for the Stylistics, as well as composing trailer music for an Independent film in Hollywood. You won’t want to miss this months showcase! Kendrick Smith will be accompanied by some of the best rhythm section players St. Louis has to offer. The rhythm section will be Adam Maness on Piano, Bob Deboo on Bass, and Kaleb Kirby on Drums. If you can’t make it to the show be sure to check out the video as we will be live streaming it on Facebook.